Highschoolers support Right Whale Research! 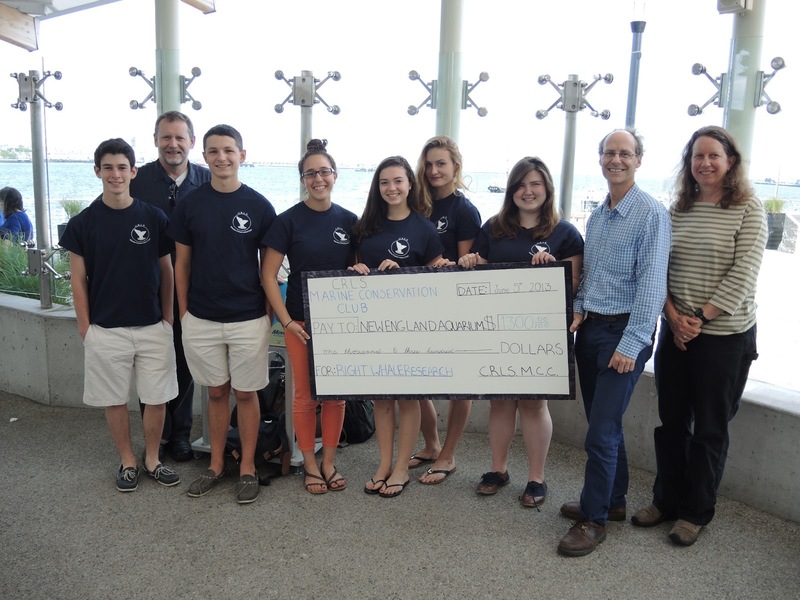 Representatives from the Cambridge Rindge and Latin Marine Conservation Club (MMC) recently came to the Aquarium to present the Right Whale Research Project with a hefty donation! The MCC is a student run organization whose goal is to raise awareness about ocean issues within their school and throughout the wider Cambridge community. This year, they focused their considerable attention on the plight of the right whale. They produced a very professional video summarizing some of the issues right whales face, and putting the future of the species squarely in the viewer's hands. The MMC also has initiated a variety of fundraising events to raise money to support the right whale work we do at the Aquarium. On June 5th, representatives from the club, along with their teacher Paul McGuiness, came to the Aquarium to present us with a check to support our research and conservation efforts. It is so heart warming to see such passion and dedication from this generation. Others have noticed this dedication too- the club was recently nominated for, and awarded, an Ocean Stewardship Award by the Aquarium. It will be exciting to see what these energetic young people go on to do next in the coming years! Students from the MMC along with their advisor Paul McGuiness present a check to researchers Philip Hamilton and Amy Knowlton at the New England Aquarium. #1: The First Rights in Fundy!